A charming collection of four beautifully illustrated stories about the unlikely friendship between Mango, a little girl, and Bambang, an Asian tapir. Mango Allsorts is good at all sorts of things, not just karate and chess. Bambang is most definitely not-a-pig and is now lost in a very busy city. When the two unexpectedly meet, a friendship begins, filled with adventures, and of course, plenty of banana pancakes. The Not-a-Pig is Book One in a brilliant series from Polly Faber and Clara Vulliamy. The Not-a-Pig is the first collaboration between two very lovely people. It’s Polly Faber’s debut as an author, and the pairing with Clara Vulliamy is very exciting for Chaos Castle as they are two people we love very much. This leads to a little trepidation on reviewing (what if we didn’t like it?) but fortunately that wasn’t even slightly an issue! This book arrived at the Castle in summer, when we decided to camp in the grounds as a summer holiday substitute. As dusk fell over the castle, we watched the bats flitting by, and then snuggled up in an (as it turned out) extremely non-waterproof tent to read. Over four nights, Bella and Posie were captivated by the tales of Mango Allsorts and Bambang the Asian tapir. The text has a timeless quality, with no gadgets to date it in future years but still feeling fresh and modern. Mango Allsorts is a proper heroine to love – independent and intelligent, but with enough flaws to make you love her all the more. 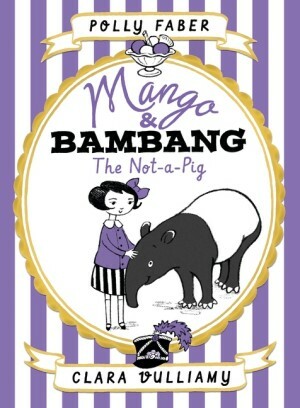 Bambang is… a tapir! Who’d think of having a tapir as the animal star? Well, Polly Faber apparently, and it works so well. Bambang is our toddler-esque newcomer to the big city with a lot to learn, and a lot to share. Seeing the world from different viewpoints is an essential skill for children, and it’s through books that we can safely learn. The four short stories are perfect for bedtime reading, or for devouring in one gulp. Bella’s favourite is “Bambang Puts on a Hat”, and Posie’s favourite is “Bambang’s Pool”. Mine is the first, because I do love an origin story; but the others are such a close second it’s easy to say they are all my favourites 😉 The book is packed full of Clara Vulliamy’s delicious illustrations. 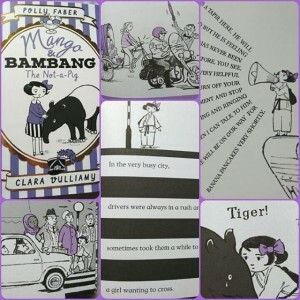 You can tell that Polly and Clara worked together on Mango and Bambang as everything gels together perfectly. The Not-a-Pig is the first in a series, with Tapir All at Sea publishing on 3rd March 2016. We can’t wait.